This blog will now have the privilege of being directly available to U.K. weather enthusiasts, thanks to Mark Vogan from Scotland, expert in meteorology. With this "collaboration", we can interact better and share weather events from both sides. "Vagaries of the Weather" will also put up a direct link to Vogan's blog. For European readers, the weather pattern in the Indian Sub-continent has basically 3 seasons: Winter, Summer and the Monsoon rainy season. Officially, the Monsoon season ends on 30th September, when Winter commences. The entire Indian region can be roughly divided into 3 zones, northern, central and southern. Winter season starts from the northernmost regions. Summer starts in the Indian region from March, the heat shifting gradually northwards. However, the northern and southern regions are the 2 areas which get winter rains. Both from completely different systems. We will discuss these as and when systems develop. However, some international models predict the formation of a low-pressure area over southeast Bay of Bengal with a westward movement. NGP/GFS model also predict upper air circulations showed near the southwest Bay and the system moving southwards, even below Sri Lanka. Subsequently, a slight increase in rainfall activity thereafter, could be the commencement of a wet regime over the southern peninsula during the first week of December according to forecasts by NCEP. 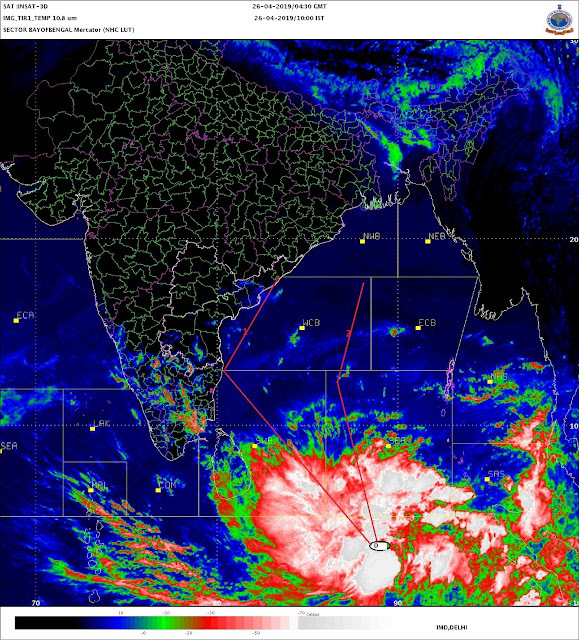 With COLA showing an increament of rains along the Tamil NAdu coast from the week begining 7th. December, the southern peninsular surely is in for some revival of monsoon rains soon! I see, some heavy rain along the T.N. coast mainly on Tuesday. For the northern sub-continent, its been dry (due to no Western disturbances at present), and cooling down to some extent. The lowest of the temperatures in India, naturally has been in the extreme northern district of Ladakh, with Darbuk at -21c. In the northern state of Himachal Pradesh, the lowest was -5c recorded at Keylong. (Far better than -12c, a few days ago). But overall, in the central and rest of the regions, the lows are almost near the normal levels. (IMD map). A map of the day's highs show the clear demarkation of temperatures in the nort, Central and southern regions. Mumbai: Clear weather throughout the week. Days will remain around the 31/32c mark, and the low, during the week,will move towards the 18-20c range from the current 21c.